For 32 years, Simply Magic Chem-Dry has been at the forefront of the carpet, upholstery and tile cleaning industry in greater Hartford and Middletown Connecticut with innovative equipment and powerful cleaning solutions. Prolong the life of your carpets, orientals, area rugs, tile, stone, marble, granite counters and upholstery with routine cleaning. Simply Magic professional certified technicians are trained to deliver top-quality service at an excellent value since 1986. We get the edges and we will move furniture where possible. We use truck mounted equipment. We guarantee against soapy residue build up and reappearing spots. If spots should come back within 30 days, so do we. 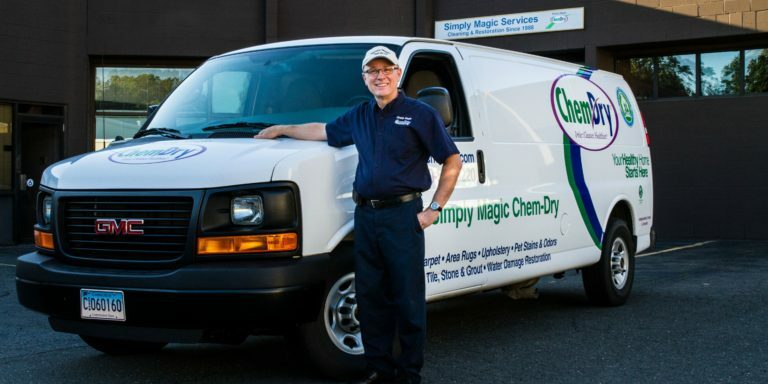 Call or email us today to find out about the benefits of the exclusive Hot Carbonating Extraction™ system for cleaning carpets and upholstery when performed by the experienced professionals at independently owned Simply Magic Chem-Dry. We Price by the square foot so you only pay for the area we clean or restore. If we clean an entire room the cost includes moving furniture. Simply Magic has up-front honest sq. ft. pricing. No room price gimmicks or “Bait and Switch” advertising. See our excellent testimonials at Angies List, Listen360, Google, CustomerLobby, Yelp and on our Home Page. Call 860-528-9220 or 860-875-7433 or go to our contact page. Monday: 9am-5pm and Tuesday-Friday: 9am-4:00pm. or by Appointment after 4pm. We are closed for all major Holidays.